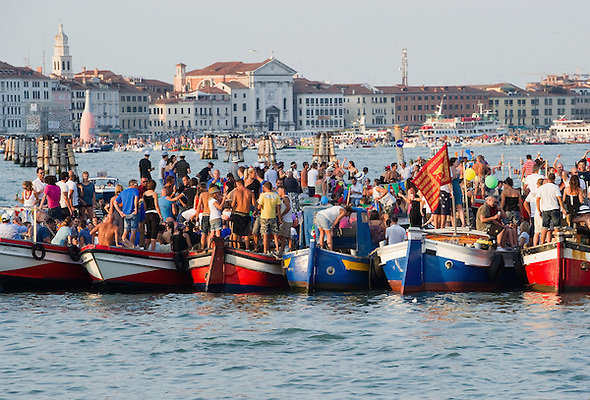 For the "famous night of fireworks", between the 3rd Saturday of July and the Sunday after, thousands of Venetians and visitors come to celebrate, in the S. Mark´s basin swarming with boats crowded with people who bring typical culinary delights. Beginning on that Saturday morning, people engages with the organisation and preparation for the Redentore Festival. Foods are cooked for up to 20/30 people; candle-baloons, leafy branches and other trinket are hanged on the boats, terraces and rooftop loggias. Soon as they are ready, those on the boats start looking for the best places in St. Mark´s Basin. After supper with relatives and friends under the showy ornamentation, everybody waits for the great firework show (the "foghi") to begin, usually around 23:00.